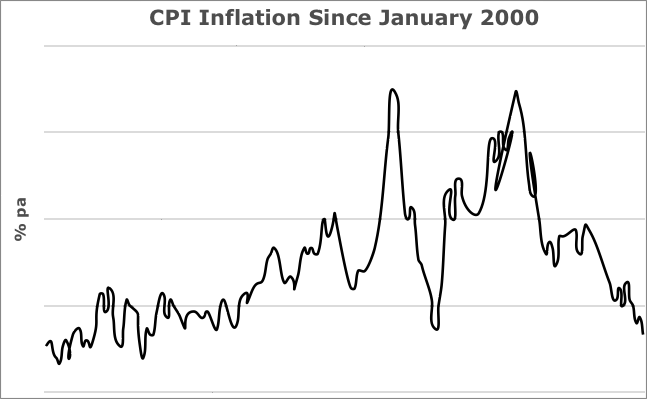 Inflation has reached a 12 year low. Inflation, as measured by the Consumer Prices Index, hit a 12 year low in November of just 1%, surprising analysts. As the graph shows, inflation has been dropping almost uninterrupted since mid-2013 and is now a long, long way from its 5.2% peak, recorded in September 2011. The Office for National Statistics, which calculates the inflation numbers, says that one of the reasons for the low figure is that food and petrol/diesel prices, which normally push up the CPI annual rate are currently reducing it by 0.4%. In the year to November, prices for “fuels and lubricants” are down 5.9%, while “food and non-alcoholic Beverages” are 1.7% cheaper. With the supermarkets at war and the oil price seemingly in free fall, inflation is set to decline further. The UK is not alone in this situation: Eurozone inflation is 0.3% and the US figure is 1.3%. Economists are now talking about a new phenomenon, “lowflation”, by which they mean a situation in which overall prices are still rising, but at a level below the typical 2% which central bank’s target. As the UK shows, when inflation is so low, the overall positive number will hide a mix of rises and falls in individual sectors. It all makes for an interesting backdrop for investment in 2015 and could mean that interest rates remain at low levels for some while longer.